I’ve participated in plenty of political marches over the years. But Monday’s Día de Acción was different: for the first time I didn’t just hold a sign and walk with the crowd, I benefited from real training about how to lobby legislators to support specific bills. That’s why local chapters of Somos Un Pueblo Unido traveled from the far corners of New Mexico to converge in Santa Fe for the day. Marching to the State Capitol isn’t just symbolic. That’s where the state’s legislators are currently in session, discussing bills in committee and voting for or against them on the floor. When it comes to the brass tacks of legislating, Santa Fe is where it’s at. Someone writes a bill. Anyone writes a bill—an individual, an organization, a legislator. A legislator introduces that bill to either the House (if he or she is a representative) or Senate (if he or she is a senator). The bill is assigned to the House or Senate’s relevant committees, where groups of legislators discuss its merits and decide whether to bring it to the floor in a plenary session. If they choose not to, the bill dies in committee. If the bill passes a vote in a plenary session of one body, it goes to the other to repeat the process—from the House to the Senate or vice versa. If the bill also passes the second round of committees and the second floor vote, it goes to the governor to either sign or veto. What’s not specified in that process? The role of lobbyists—that is, people who advocate for or against bills at any step along the way, pressuring legislators to act in their interest. Anyone can lobby. For most people, the word “lobbyist” conjures the image of a suit-and-tie professional who’s paid to represent a specific interest group (an industry, a company, a nonprofit…). But if you act to influence your legislators, you’re a lobbyist, too. Lobbying can mean calling your representatives or senators, writing letters, signing petitions, marching, rallying, attending committee meetings or plenary sessions, scheduling meetings to talk with your legislators, or literally hanging out in the lobby outside their offices so you can catch them for a few minutes to talk while they walk to their next appointment. To lobby effectively, we don’t just describe our values or opinions in vague terms, we talk about specific bills. We tell our legislators whether we want them to advance those specific bills or kill them in committee, and whether we want them to vote for or against the bills if they make it to a plenary session. Which brings us back to some of the bills that are up for debate in New Mexico’s 2019 legislative session. The group outlined a variety of bills of interest, including Senate Bill 196, which would prevent state and local agencies from expending resources to enforce federal immigration law; House Bill 141, which would prohibit state agencies from disclosing sensitive information; House Bill 31, intended to raise the state minimum wage to $12 per hour; and Senate Bill 278, aimed to limit obstacles in maintaining a driver’s license or ID. The legislative process can feel dense and opaque. But anyone can read the full text of any bill at any time, and monitor its progress as it advances through the legislative process (or dies along the way). Democracy! RELATING TO FEDERAL USE OF STATE RESOURCES; PROHIBITING STATE AND LOCAL AGENCIES FROM EXPENDING RESOURCES TO ENFORCE FEDERAL IMMIGRATION LAWS; RESTRICTING AUTHORITY OF SHERIFFS AND JAILS TO HOLD FEDERAL DETAINEES; REPEALING A REFERENCE IN STATE LAW TO A REPEALED FEDERAL LAW. RELATING TO STATE RESOURCES; PROHIBITING THE USE OF STATE LAND FOR THE CONSTRUCTION OR REPLACEMENT OF A BARRIER ORDERED OR SOUGHT BY THE FEDERAL GOVERNMENT ON THE STATE'S BORDER WITH MEXICO; PROHIBITING THE USE OF STATE RESOURCES TO BE USED FOR THE CONSTRUCTION OR REPLACEMENT OF A WALL OR BARRIER ON THE BORDER BETWEEN THE UNITED STATES AND MEXICO; DECLARING AN EMERGENCY. The sky was just beginning to lighten yesterday when I drove over the railroad tracks and past the shadowy silhouettes of Albuquerque’s downtown. My goal: get to El Centro de Igualdad y Derechos in time to join a bus or carpool up to Santa Fe for the day. I parked on a side street only to be disappointed: the lights were on, but nobody was home. There was just one other man waiting at the center’s door, bundled in a coat and knit cap. We shook hands through his fingerless gloves and chatted for a few minutes. Still no sign of the others; did we have the time wrong? After a few minutes I told him I didn’t want to miss the 8:30 training, so I’d just drive up myself. Spanish first, then English. So it went for the next two hours of training—the packets they passed out, the PowerPoint slides they projected, the presenters’ explanations. In fact, the presenters rarely spoke English at all unless they were prompted by a specific question. This Día de Acción del Inmigrante y del Trabajador was truly by and for Spanish-speaking immigrants. I don’t speak Spanish. Well, hablo un poco—estudio español, pero no conozco muchas palabras. So I sat quietly through the training and just tried to absorb as much as I could, including reading the packets they handed out to everyone. They covered the structure of the New Mexico legislature, the process by which bills become laws, and the fine points of several bills that are currently in the works. More on those bills later. First: we march! At 11 o’clock, some four hundred of us hit the streets. Our long train of pueblo unido wound its way through Santa Fe to the Roundhouse, where the legislature is in session. A forest of colorful signs bobbed overhead; cars honked their support and flashed thumbs up as they passed, at which we erupted in cheers each time. The teens in front of me giggled and joked while the older women behind me led fierce chants: El PUEBLO / UNIDO / JAMAS SERA VENCIDO. The people / united / will never be defeated. As we reached the State Capitol, our long parade spilled into a single throbbing crowd met by live music and a table of hot foil-wrapped burritos for everyone. Marching and cheering became dancing and feasting. The day of community action, like the sun itself, hit its high point at noon. 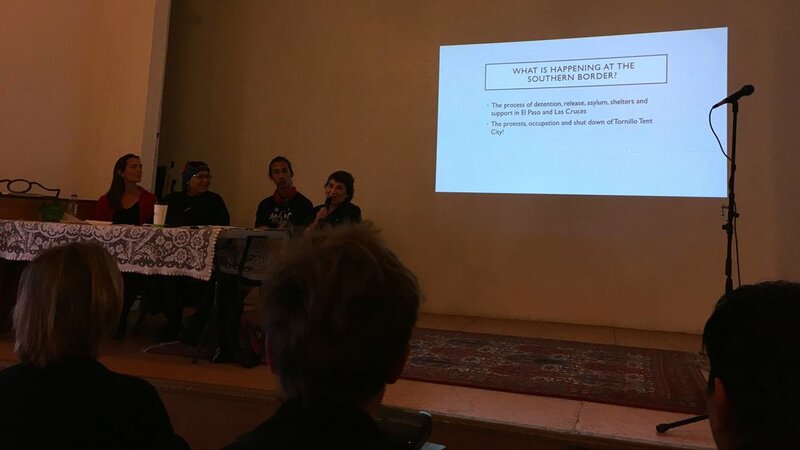 Everyone who attended Saturday’s panel on immigration left with a printout detailing how we could volunteer, where we could make donations, and what legislation is currently worth lobbying for. Sure, I can call my state legislators. But I’ll do you one better—it so happens that ACLU of New Mexico is hosting an Immigrant Day of Action at the state capital the following Monday. Count me in. After attending Saturday’s panel presentation, I spent most of the day Sunday going through the notes I scribbled, photos I took, and a few audio clips I recorded. Here’s my transcription of Sayrah’s story. I volunteer at a makeshift shelter based out of a church in Las Cruces. All of us who volunteer there have had a background check, we all were trained, we’re very very concerned about preventing—the history of the Catholic Church is unfortunately at play, so they’re really scrupulous about providing checks and training for people who are working in the shelter. Everyone that’s there is a parent with children. The way that it works is the detention centers are very full. Recently an article in the El Paso Times talked about cells designed to hold ten people holding closer to thirty or fifty people. Migrants tell us they’re getting one bottle of water a day. And so when we think about the young girl who died in New Mexico, her father says she was given one bottle of water a day. I can’t go on one bottle of water, especially if I had come from a journey. There’s freezing temperatures, it’s really horrible for people. And they’re kept in cells, and they’re sleeping on cement floors. When they come to our shelter, they’re being released because of the ruling that children cannot be kept longer than I believe it was 21 days. So they’re being released with their parents. I.C.E. actually drops them off at our shelter. They have this very tenuous situation where they’re releasing people to shelters into Las Cruces. They create a lot of chaos, they don’t communicate, they’re very difficult. We don’t have good things to say about them, but they do have to release people somewhere and we’re willing to support people that are released. When they first get released, they have nothing but the clothes on their back. Many of them have experienced tremendous violence, they have had everything taken from them, and they have nothing. They’ve been through a lot of trauma. We, before they get there, we set up the shelter with cots, which is better than the cement floor they’ve been on. We get new clothing for them so they can have a change of clothes. We have hot showers so they can shower. They have no clothes except the ones they journeyed in. We make a caldo, it’s a really healthy comfort food with like chicken and veggie stew, we have tortillas, we have oranges and fruit, we have a volunteer doctor who does a medical assessment on everyone who comes in, and there are really people who are sick and children who are sick. This is all volunteer staff. It’s all donations, we use donations to run it. When they come off the bus, they don’t know where they’re coming to and they’re very afraid. All they’ve experienced has been people being horrible to them. And so we make a welcome line so as they come off the bus and they enter the shelter, we’re welcoming them, we hug them, we greet them. When we serve them caldo we sit with them and we eat with them, we’re not standing over them, we’re eating with them. If they want to tell us their story they can, but we don’t question them. We just want to eat with them. The children start to warm up. There’s toys, they realize it’s not a detention center. The first thing they notice is there’s a hallway, they can run. Some of them start running up and down the hallway! I mean, they’ve been locked up in jail. Up until now they’ve been on a journey where they have to be quiet, they have to hide—and now they can play, they can run. Some of the kids are too traumatized and they don’t run in the hallway, they sit in the corner and we might get a puzzle out for them. People are able to go shower, pick out fresh clothing. Some of the women have been carrying babies and we offer to hold their babies so they can finally shower and to give them a break. Everyone needs to get to their sponsor. And their sponsor is not in New Mexico. So at this point they have the case for asylum, and their sponsor might be in Kentucky, Indiana, Florida, or Rhode Island, Wisconsin, West Virginia, and we have to get people all over the country. So in the travel room, we have all our volunteers, and our job is to help find a bus or a plane ticket that can get them from Las Cruces to wherever they’re going. I had a woman ask me, how far is it by bus to Kentucky? I said maybe two or three days, and she just started crying. She had all these children with her, and she thought she was finally to her sponsor. But our country is so large, land-wise, and so, she was just realizing that. So. We stay up till ten o’clock at night trying to get everyone’s bus tickets. Then people can sleep there, and in the morning we have another group of volunteers that takes people to the bus station and the airport. People have not ridden our planes, some of them don’t speak English, they don’t speak Spanish, they only speak their indigenous language. So this is a really hard process of like, how do you get people on the bus that’s gonna transfer from here to Texas, Texas to Atlanta, Atlanta to Florida, Florida to—I mean, trying to explain that. The donations you brought today for food, for snacks—we don’t always have money to give people. And so we’re packing their bags with as many healthy snacks as we can, because they might be on a 3-day bus journey with children and no money. Someone really generous in Albuquerque at a donation drive just put an envelope full of $20 bills. I don’t know who it was. I was so moved that they trusted me. It felt so good to go down there that night and give a $20 bill to every person that was getting on the bus with their children. I though, okay, at least I know that they’ve got $20 between here and Rhode Island. I want to lift up these incredible women in Las Cruces. It’s almost entirely women, I was comparing notes with Eleanor in El Paso and it’s almost entirely women there too doing this work at Annunciation House. These are the people who are resisting. These are the people who are showing a different version than the oppressive system that we’re in. We need radical system change, but we also need to help people each day. We need both. Albuquerque is a small city. A small world, really. Live here three years and it’s like you know everyone, or at least keep running into the same people. One of the presenters yesterday, Sayrah—I knew her name was familiar—also presented at last year’s library seed swap, where I stocked up on so many of the seeds for my garden. That bowl of tiny amaranth seeds? She brought those. The forest of fuchsia amaranth lining our wooden fence behind the tomatoes and eggplants grew from a single teaspoon of her generosity. Another of the presenters was my friend’s younger brother. The last time I saw Nicolas, we were talking at a house party: I was scooping his homecooked beans from a crock pot into a bowl while he recommended one of his favorite cookbooks, Decolonize Your Diet. I dutifully read it a month later and was happy to add it to my bookshelf. It includes recipes for amaranth, by the way. How funny to take a seat at that talk, look up, and realize I knew half the panel. I didn’t just know them, I’d grown their seeds and eaten their food. Turns out, in the year since I’ve seen them, they’ve been busy. Nicolas camped out at Tornillo to protest the tent city where I.C.E. has housed thousands of children who were apprehended after crossing our southern border. Sayrah volunteers with asylum-seekers, helping to house, clothe, and feed them after I.C.E. releases them to makeshift shelters in Las Cruces. It’s easy to feel useless, sitting at a dining room table, reading the news, close and far all at once. That’s how I felt the other day. But I’ve got the power to act, too. Start listening, and you’ll learn where action is needed. 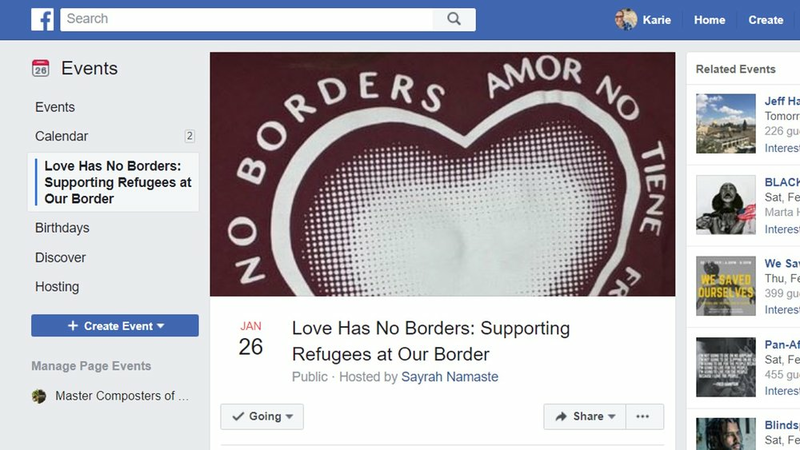 Come learn about how you can help volunteers who are providing assistance to the Central American families at the border and how to participate in the direct action and protests against the oppression of refugees at our borders. Hope Alvarado, a lead organizer with The Red Nation fighting for Indigenous Liberation through a lens of Anti-Settler Colonialism, Anti-Border Imperialism and smashing the patriarchy — they’ve been resisting at the Occupation in Tornillo. .
Of course, there’s already a vitriolic mix of reader comments on the link’s Facebook post. As for me, after reading the article and groaning my way through the comments, I turned to the paper map of New Mexico that’s tacked to our dining room wall and traced the route from Albuquerque to Antelope Wells. 330 miles; close to five hours of driving. I don’t know what I’m contemplating. I just have this urge to witness what’s really happening at the border there. Sitting at a table in New Mexico’s biggest city, I feel so close and so far. Even the reporter who wrote the article seems to be firmly rooted in Las Cruces, which is only halfway closer—150 miles from the port of entry, two and a half hours of driving. Her facts, quotes, and photos are all credited to the Border Patrol itself. There’s no information about what happened next—where were these 306 migrants, “mostly parents with children and unaccompanied minors from Central America” who “arrived just after midnight on Thursday” (last night) sent after they were apprehended? How are their asylum claims being processed? Where are they being held? Last month, two Guatemalan children died in U.S. custody in the days after their fathers turned themselves in—after they were apprehended. According to the Border Patrol’s news release this time, “Some of the juveniles were in need of immediate medical assistance and were transported to local hospitals for treatment of various illnesses and injuries.” How are they now? How can we know? Is anyone investigating, or do we just wait to see if the Border Patrol releases another statement? So much huffing and puffing of hot air in Washington and on cable TV over the border and a bollard fence or five-billion-dollar wall. But who’s actually there to see what it’s like, what’s needed, who’s dangerous or in danger, who’s exploiting or being exploited? I want to drive the five hours down there and camp and see for myself. But I’d be so useless, Anglo and alone in all that desert. With so many political opinions spewing on social media these days, it's hard to believe your "Letters" page is facing a shortage. And yet in v28 i2 you wrote that "these days, [you] rarely receive letters from locals." I hope this week you're so inundated by New Mexicans' opinions that you don't have room to print this. But just in case, here's what's on my mind here in Albuquerque. Trump's televised Oval Office address on Jan. 8 was just the latest in his years-long pattern of race-baiting, fear-mongering and fact-altering. He said there’s “a growing humanitarian and security crisis at our southern border.” In fact, there's no new or noteworthy threat to our national security. And the only humanitarian crisis is the one manufactured by his policies—criminalizing everyone who crosses outside a port of entry, rather than distinguishing between traffickers and asylum seekers; separating children from their families, without any procedure to reunite them; imprisoning immigrants for prolonged periods, rather than freeing them while they await their day in court. He said “90 percent of [heroin in the US] floods across from our southern border.” In fact, the vast majority of illicit drugs imported from Mexico are smuggled at legal crossings—to say nothing of fentanyl flown in from China or home-cooked meth. Walls in the wilderness won't address any drug crises. He said a wall would “be paid for indirectly by the great new trade deal we have made with Mexico.” In fact, that is simply not how tariffs or budget appropriations work. Here are the facts. Constructing hundreds of miles of new steel fencing or concrete wall would disrupt ecosystems, sever sovereign tribal land and block desperate asylum-seekers who have a legal right to enter the country and plead their case. Meanwhile, illegal drug and human trafficking would continue the way it always has: in trucks and shipped packages, through official ports of entry and tunnels. But Trump doesn't care about facts. He cares about the cheers of his riled-up base and the applause of TV pundits. Sean Hannity and Ann Coulter have become our White House policy advisors. Stephen Miller is our national propaganda generator. Trump's Twitter feed claims to speak for us. Hell, the Conservative Caucus of Warrentown, Va., gets to fill the pages of our Albuquerque alt.weekly? Hey, New Mexicans—what do you have to say about all this? It was here in New Mexico, near the remote Antelope Wells port of entry, that 7-year-old Jakelin Caal crossed into the US to seek asylum. After less than 48 hours in Border Patrol custody, she died of dehydration and shock. It was here in New Mexico, at a bare-bones facility in Alamogordo, that 7-year-old Felipe Gómez Alonzo was held for two days. On Christmas Eve, he died at an Alamogordo hospital. It's here in New Mexico, across our rugged desert and private ranches, that Trump wants to seize land and stud it with steel. Not because he cares what happens here—just for a photo op and bragging rights. What do the people of New Mexico think about the fact that Trump's orders have deliberately created bottlenecks at the country's busiest ports of entry in San Diego and El Paso, grinding asylum applications to a virtual standstill? What do we think about the fact that this manufactured backlog is shunting desperate people into the dangerously remote desert in between—our state's southern border? How do we feel, knowing that this administration's policies have caused children to die in our hospitals? That next they want to spend billions of taxpayers dollars to plant steel bollards across our landscape? How do you like being a political football for the rest of the country's raging debates? Personally, I'm sick of everyone else speaking for us. Write to the Alibi. Let's talk.